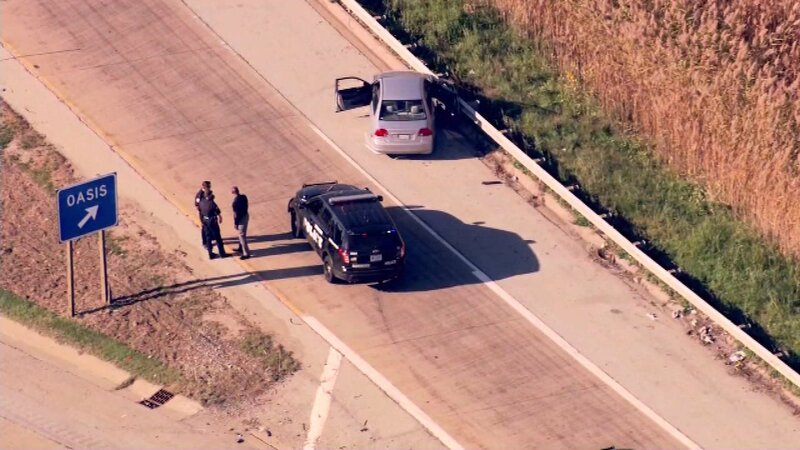 SOUTH HOLLAND, Ill. (WLS) -- Illinois State Police officials are investigating a shooting on I-294 northbound on the entrance ramp to the Lincoln Oasis on Monday afternoon. Police say a pursuit began in Hammond, Ind., around 12:15 p.m. after a report of shoplifting at a Cabela's store. Officers chased the man outside the store, Tasering him twice. They say he fired a handgun at them once but missed. The suspect jumped in his silver Honda Civic in front of Cabela's, . An officer gave chase on Indianapolis Blvd. to 80/94 westbound. The suspect fled into Illinois on 294 and stopped on the entrance ramp to the Lincoln Oasis in South Holland. A Hammond officer approached the vehicle and reported seeing a white puff of smoke inside. No police officers fired their weapons in the incident, police said. Police said the suspect was confirmed dead from a self-inflicted gunshot wound to the head.